Hooray! Another UFO completed. This one was begun in March (2009?) at our guild's Quilt Fest - Donation Quilt Workshop. I was so busy talking that all I only got the cutting and first sewing done. The sewn strips hung in my sewing closet for over a year before I decided that I needed to put the quilt together. 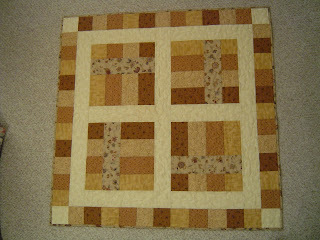 Two quilting friends came over for a sew day a couple of months ago and this was the project that I chose to work on. The funny thing was...I didn't even remember that it was on my UFO List!!! A few days later...off I went to my mini group. This quilt top was part of my show and tell for the day. Lucky me! 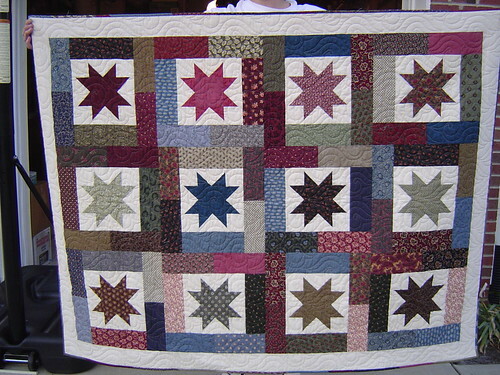 One of my friends volunteered to quilt it on her longarm. So...the waiting began. I wasn't in a hurry because the quilt was to be a donation quilt. I worked on other projects in the meantime. The quilted piece was returned to me on Monday of this week. However, it wasn't at the top of the list for finishing so it had to wait its turn. That turn came the next day (Tuesday of this week.) Once my other projects were completed I could devote time to working on this one. I was quilting with 2 other friends and brought Patriotic with a Twist along to make the binding. And, make the binding, I did...only to discover that I had cut the strips incorrectly! You see, I was trying a two-color binding technique that yet another friend had found on the internet. Once the strips were cut and sewn together, I found that I had run out of time. Sadly, it was time to go home. You know what happens at home, don't you??? Dinner and laundry, etc. Another day passed without preparing the binding. That brings us to Wednesday of this week. You won't BE-lieve it!! The kids are home from school!!! Icy conditions in the morning and who knows what it will be in the afternoon? I did manage to make time for quilting. The binding situation was cleared up. The binding was prepared, attached, and sewn down! You know what that means, don't you??? The machine is not as quiet while sewing as it was before its vacation. I'm hoping that it simply needs the kinks worked out and NOT a return trip to Mr. Fix-it! I'll have to give a call to see what he thinks about it. Meanwhile, I completed the binding on one quilt (The Quilt Test) and began prepping binding for another (Patriotic With a Twist.) Look for a photo of the Soldier quilt within the next week or so. I'm hoping to finish it off for the UFO Club. The fall session is quickly coming to a close. When Lindsay at www.mequilting.com put out a call for pattern testers on www.ravelry.com, I responded. Telling her that I would be happy to test her pattern was the one of the best things that happened to me during the month of November. Testing her pattern firmly pulled me back into my quilting studio. I've been spending MUCH more time in there since. As I mentioned in my last post, it's a fast and easy quilt to make. 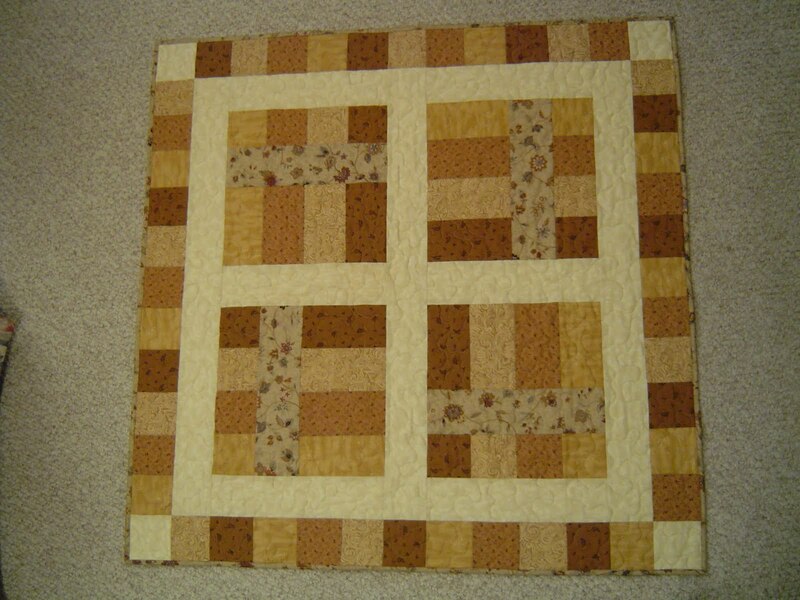 The pattern is called Boxed Ribbon Baby Quilt, but it can be adapted to fit any recipient. 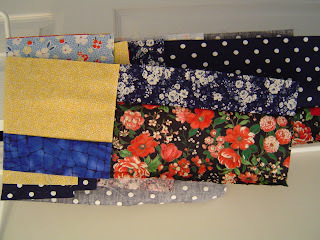 If you have 5 FQs, some background, backing , and binding...you can make this quilt. (Even if you are a beginner!) Need a bigger quilt? 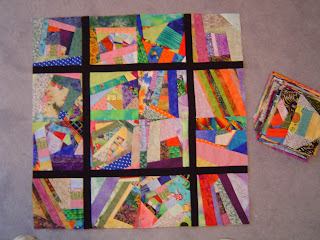 Just multiply the number of blocks you make and add more strip sets around the outside border. Lindsay's pattern is set to be released Wednesday, 12/15/10 on mequilting.com and will be available to purchase for approx. $6.00. I've been working on a new quilt (off and on) for the past couple of weeks or so. I was the "pattern tester" for a friend on Ravelry. Her pattern will be released for sale this week on her blog. 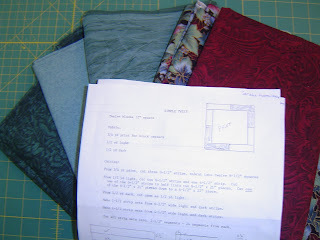 It was a fast, easy quilt so I'm sure that YOU are going to want to make one, too!!! Watch for more details in the next couple of days. So...anybody wondering what happened with the spitting machine? Goodness knows, it could have been much, MUCH worse! The machine went on an extended vacation due to the fact that my repair guy keeps limited shop hours. Every time my friend called or went by to drop it off, the shop was closed! Can you IMAGINE not being able to sew on your favorite piecing machine for a month??? I'm going to pick up my machine on Tuesday. Just in the nick of time...I've got a quilt due on Wednesday and I really miss the built in dual feed/walking foot on my Pfaff. There's still binding to apply and be stitched down. Too many puckers without that feature! HELP! My Sewing Machine Spit at Me! I was happily sewing along, to finish ONE MORE BLOCK, when I ran out of bobbin thread! (Isn't that ALWAYS the case?) I stopped, pulled the bits off, and forgot that I was out of bobbin thread... so I started sewing again. It was good and truly jammed so I removed the bobbin casing and tried to ease the machine into submission. It was having none of THAT! (Maybe this is when it went THUNK!) Then it proceeded to spit a piece of metal at me! Can you IMAGINE??? I meant to get back to you sooner, but I've been distracted by my knitting. Please forgive the fact that I've kept you in suspense for more than a week. Here's what I wanted to show you. It's what I saw when I went looking for my quilt at the quilt show. MY quilt, with a 1st place ribbon attached!!! I can't tell you how excited I am. Of course, I said YES!!! My local quilt guild has some amazing quilters among its ranks! 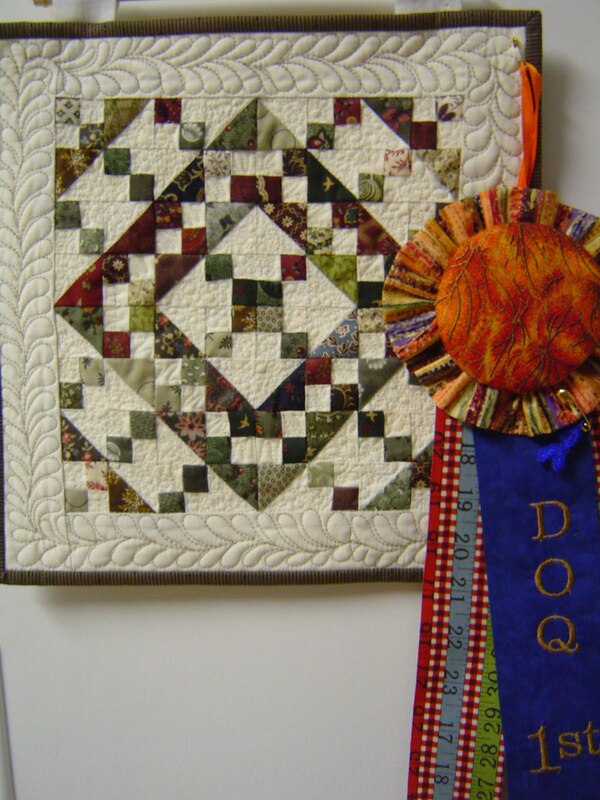 We host a phenomenal quilt show every two years. When walking through the show, one quilt is better than the next and the one after that is even better than the last. You would be fascinated by each and every one. 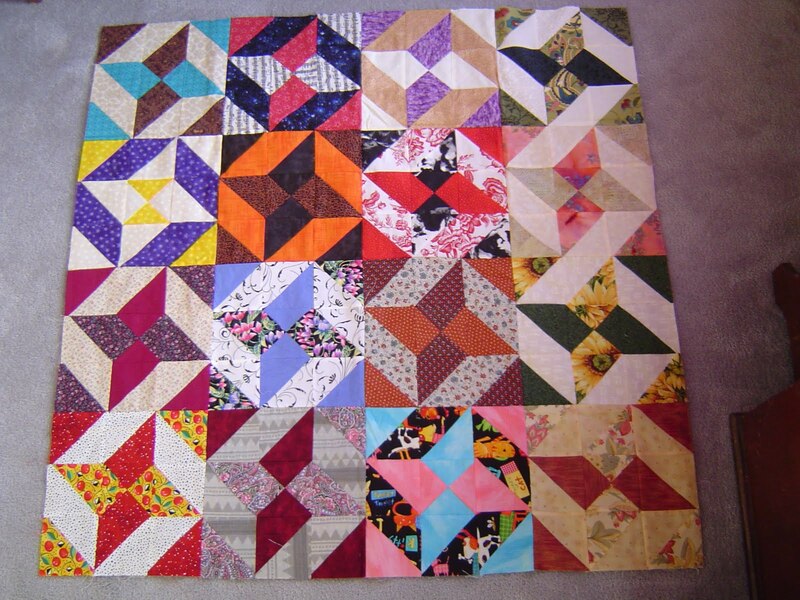 There are traditional quilts, art quilts, pieced and appliqued quilts. Colors and patterns abound. This year I entered 4 quilts in the quilt show. Like always, I signed up to have them judged. I do that, not necessarily in the hopes of winning anything, but just to see what the judges have to say. Some quilters find entering their work in shows nerve-racking (at best) and absolutely excruciating (at worst), but I find it exhilarating. While the judges negative comments can sting, postitive comments confirm (or inform me of) the things that I do well. I have friends who are "ribbon driven." They enter quilt shows expecting to win ribbons. They are sorely disappointed when/if they don't. I like to go in with a more positive attitude. I enter to share what I've been working on since the last show. Of course, I 'hope' to win a ribbon! (I'd be lying if I said I didn't.) 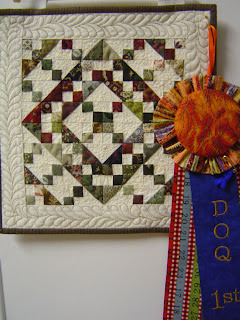 The difference is...it's a pleasant surprise when/if one of my quilts is a winner. This year, I entered as a professional since I make quilts for money from time to time. Although, quilting isn't my primary occupation the definition was a bit vague and I decided to err on the side of caution. This dashed my hopes of winning ANYTHING this year! Oops! The camera is unavailable. I'll have to show you later. The (Ravelry) Fall 2010 UFO Club only began 14 days ago and we've had a number of finishes already. This session has 10 members and, so far, 4 have completed at least ONE quilt each. We're off to a good start! 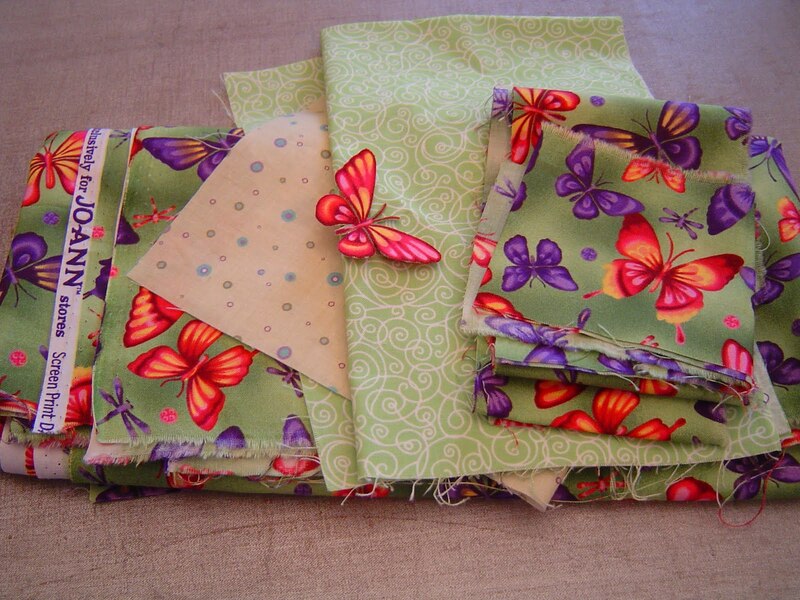 Butterfly in 3D - #3 is fresh off the sewing table. It's the third in a series of butterfly quilts using the same butterfly print and an easy technique that I developed for making the 3D butterflies. It's my first finish for the Fall 2010 UFO Club. This butterfly quilt is a bit larger than the last one. 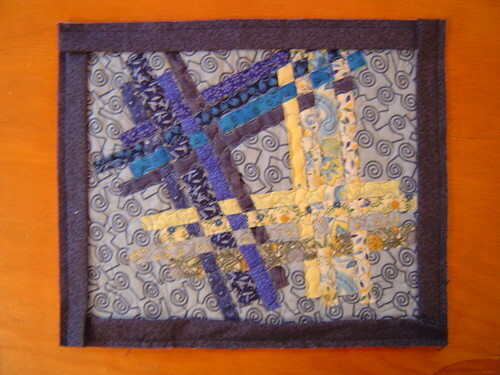 At 9" square, instead of the 8" square of the last quilt, I'm hoping that I didn't throw the balance off. Hopefully, the recipient will be pleased. 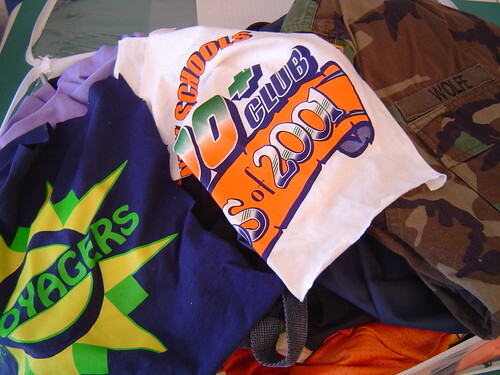 These were leftovers from the Summer 2010 UFO Club and can be seen in an earlier post. Yes. That’s 15 UFOs for this session. The scary part is…there are MORE!!! Thanks for cheering us on. We are now gearing up for the Fall 2010 - UFO Club. Watch for the List! Another UFO, but not one on the list! I started the binding at my quilt bee meeting this morning and finished it on the way to the Carolina Longarm Quilt Show this afternoon. I posted the bulk of this quilt's story when I finished the quilt top, but you may be intersted to hear that it took three times to get a good photo of the quilt. I also had to apply the binding THREE times before I got it applied properly. Oh, and you’ll never believe it, but all 3 of the people in our car won door prizes at the quilt show! Perhaps, the quilt needs a NEW name! Aside from the free-form Flying Geese featured in my design, this little quilt showcases a "new-to-me" pebble quilting design. The "pebbles" really add a textural element to the quilt! 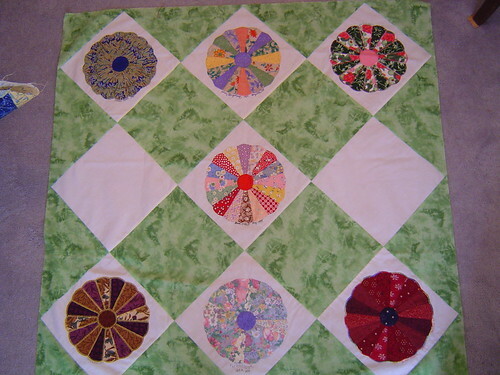 In my last post, I shared my quilt called Flying to the Candy Dish. It was made of the same design, but what a difference fabric selection has on the overall feeling of a quilt! 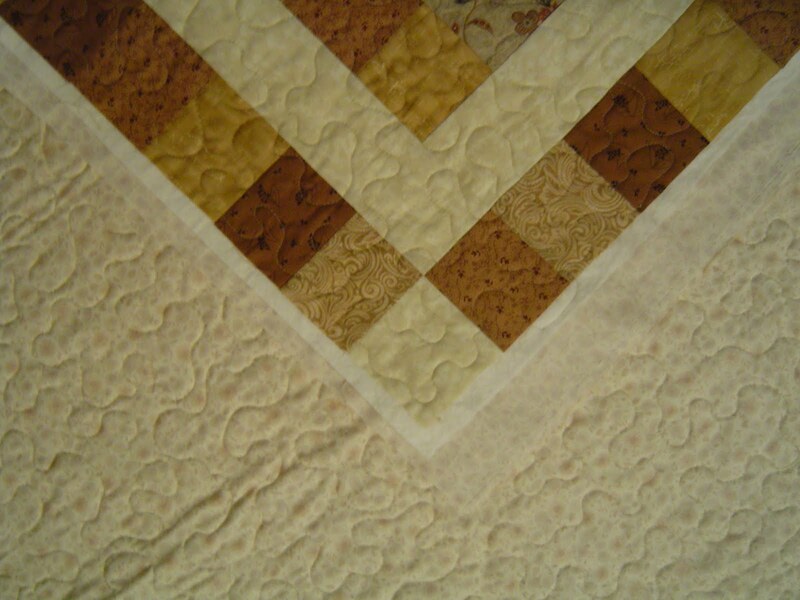 The finishing details are different in each quilt. Where I added machine feather stitching to that quilt, this one was finished using a satin stitch zigzag for the machine applique. That one had the geese on a black "path" in a field of color and this one has geese on a colorful "path' in a field of black. 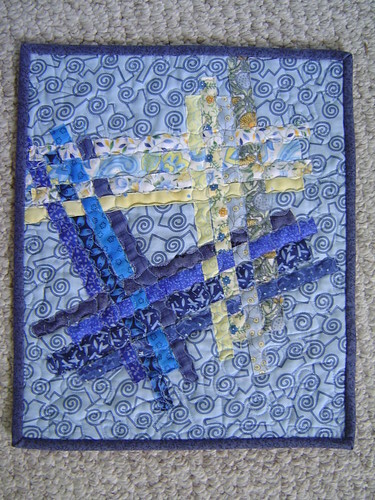 Loose-y Goose-y was made as a Journal Quilt and measures 8" x 10'. Not the "standard" size the other quilts in my JQ series, but several friends have assured my that it's perfectly OK! Today I decided to do some decorative stitching to secure the raw edged applique and add a bit of interest around the completed quilt. In retrospect, I probably should have added a piped binding, but it's too late now...the quilt is DONE!!! This isn't on my UFO List, however, I'm glad to have it done ahead of schedule. It started out as my "Dye Frenzy Challenge quilt and may end up being my donation to the "Little Bit of Pink and a Whole Lot of Love" charity quilt auction at the DOQ "Quilting - A Needle Runs Through It" Quilt Show 2010 to be held at the American Tobacco Campus, Bay 7, Durham, NC Oct. 22 - 24, 2010. Remnants - A Completed UFO!!! This mini sat on my table for more than a YEAR waiting to be quilted. Ultimately, I decided that I wanted this one to be extra special so I enlisted the help of a local longarm quilter. I think it was worth every penny! 1. a remaining, usually small part, quantity, number, or the like. 2. a fragment or scrap. The fabrics in this mini started life as the makings of a king sized quilt. 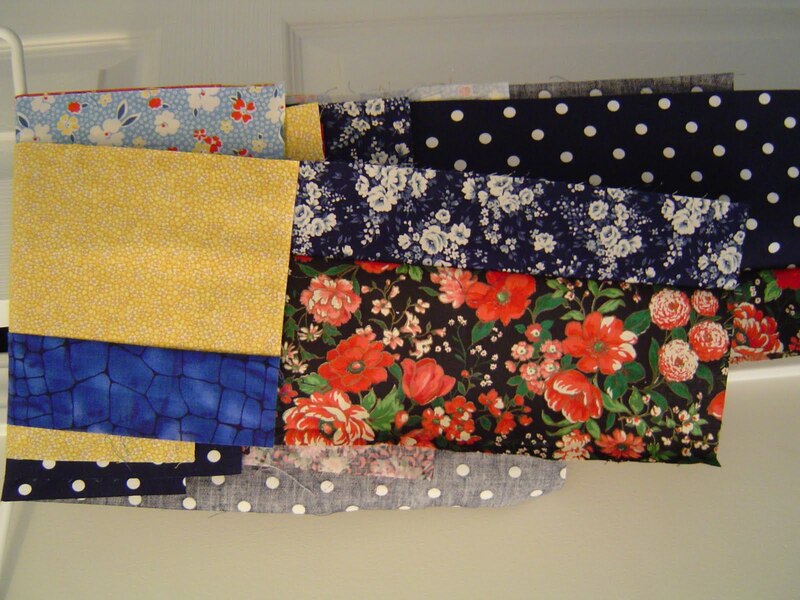 Being the math whiz that I am, once made, there were a number of quilt blocks remaining...so I made a lap quilt. After making the lap quilt, four blocks remained so I made a wall hanging. You would think this would be the end of those fabrics...but NO!!! There's MORE. School was ending and I needed a gift for DS2's teacher. 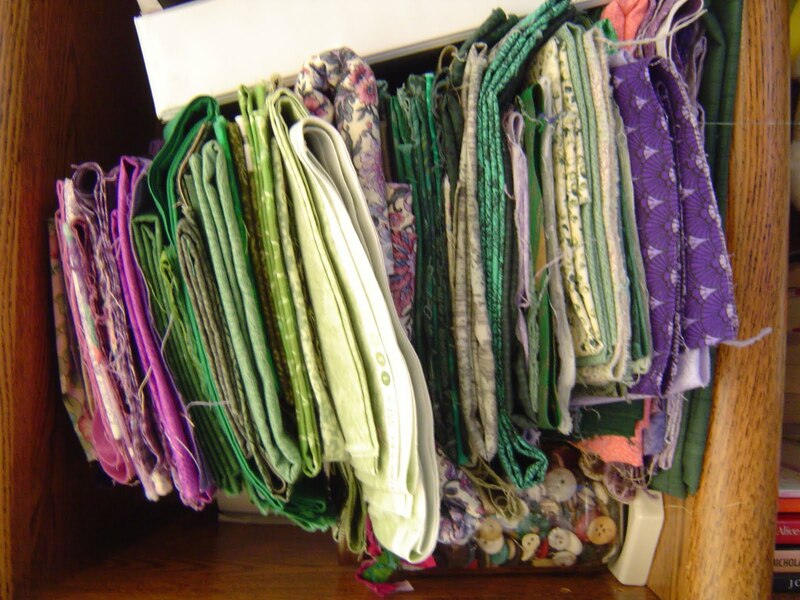 Upon finding that she was fond of hunter green and burgandy, I knew that I had JUST the thing...a miniature quilt from the "quilt that keeps on giving." 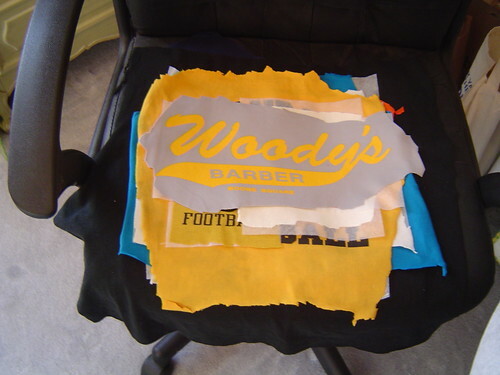 Most of the pieces had been trimmed up. All I had to do was come up with a design. It turned out that I came up with three designs and implemented two of them. Remnants is the second of those two designs to be completed...and there are STILL more scraps!!! Remember the Dye Frenzy earlier this summer? Well, the organizer of the workshop issued a challenge to the participants. She wanted us to USE some of the fabrics that we had hand dyed! This little quilt is the result of that challenge. Each of the triangles represents one of my hand dyeing efforts. The black "background" really sets off the colors! My "border" fabric was a small piece that I found in the "kid print" drawer of my fabric stash. 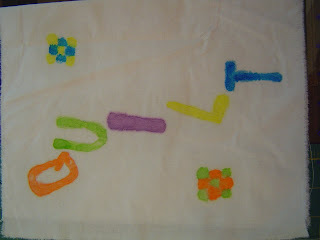 The candy shaped motifs, and the comments of a Ravelry friend, worked well to help me arrive at the name for my quilt. I'm not sure where this quilt will end up, but while it remains in my home, smiles abound. It reminds me of "the cousins" at Grandma's house heading straight for the candy dish when they walk through the door. Hmm...what quilt shall I work on next? Another quilt for the Ravelry UFO Club. This one started as a woven piece that needed something extra. It ended up being a lesson in a 'new to me' binding technique. Thanks to my good friend for giving me a lesson in mitered bindings so that I could accomplish the two color binding. I began with scrap strips leftover from a larger project to experiment with weaving fabric. Months went by before inspiration struck and I thought I would add a quilted sunflower. The more I looked at it, the less appealing that idea became. Inspiration struck a second time and the raw edged applique that you see was the result. 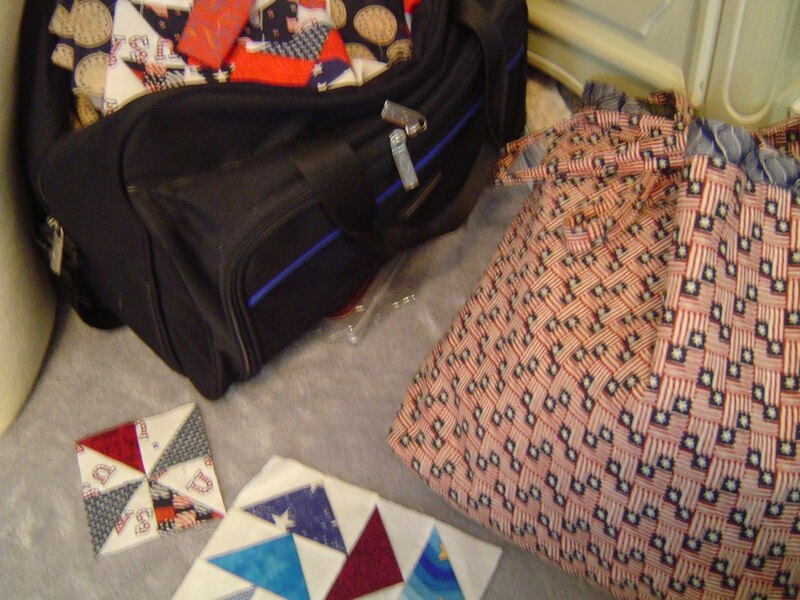 Once the quilt was completed and the photo op was complete, I noticed that I had deviated from my plan. The blue was to be near the flower and the yellow was so be on the opposing sides. What do you think? Should I bother to re-do it? P.S. I think I'll call it Sunflower Surprise. Months ago, I designed this 8.5" x 11" Journal Quilt as a pencil drawing on muslin. I waited (and waited) to implement the design. Why? I couldn't decide how I would accomplish the piecing. At first, I was thinking that I would do foundation piecing. That is by NO means a favorite method of mine! A friend suggested fusible applique. That's when I knew my design could become a reality! I hope you like the (unfinished) result. Michael's T Quilt - DONE!!! The quilt was supposed to be as small as I could make it using the items provided. It turned out to be 67" x 91" and that was as small as I could make it! This photo was taken from the top down, hence the funny looking angle and the name of the post. Oh, well...a bad picture is better than NO picture. Right? Everything is cut. The blocks are ready to sew. However, the borders still need a bit more work! I have to decide if I can cut down the two corner squares and plan the borders accordingly. Soon enough, this will be my next completed UFO. Wish me luck! 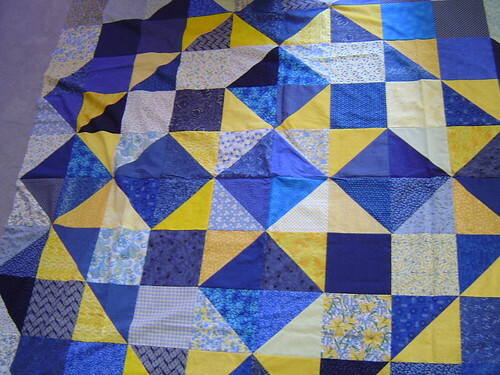 Here's what I did to the Blue & Yellow Woven quilt. I had intended to do a Sunflower in quilting, but somehow I ended up with an appliqued Sunflower, stem and leaves. There may be more to come. It's been almost 10 days since my last post. Why? Lots going on around here. I played "Mom's Taxi Service" all last week and if I wasn't dropping one son off, I was picking up the other one! The time in between was spent working on knitting and quilting UFOs, but nothing was completed. During the week, I worked on three (oops! four!) different projects for the UFO Club. I shared this information on Ravelry, but didn't have any new pictures to share here. I worked on Michael's T-shirt Quilt, trimmed down the Jacob's Ladder, completed the next step on my Circle Denim Quilt, and added applique to the Blue & Yellow Woven quilt. Just when I was ready to post a picture today...I realized that I left my project in a friend's car!!! Yesterday my quilt bee got together for a Dye Frenzy. 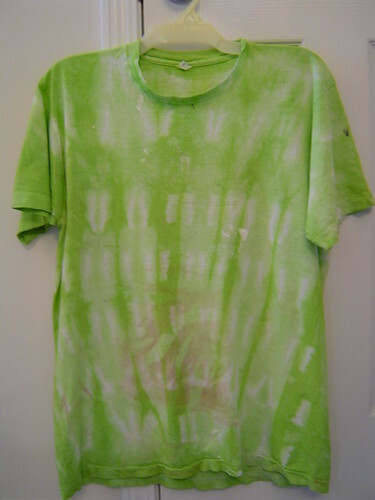 We used DYLON Permanent Fabric Dye. It takes 4 cups of warm water to dissolve and you add 4 Tablespoons of table salt to that. For a deeper or more vibrant result, that's it! Simply drop in your fabric and wait. Otherwise, you can add up to 4 cups of cold water to increase the amount of fabric that you can dye. The method used for dyeing the T-shirt was to accordian fold it lengthwise and place large office clamps at varying intervals. I'm pleased with the way it turned out. It could have been considered for over-dyeing, but I ran out of time. 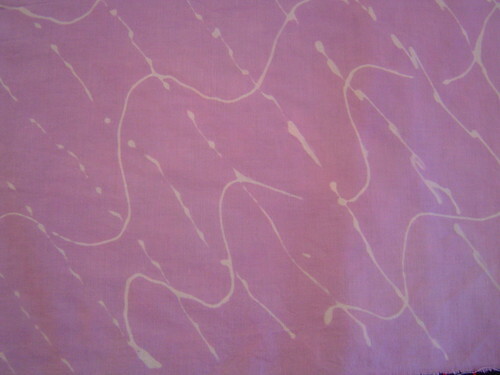 The purple piece was done by drawing lines with glue gel, allowing the glue to dry, and then placing it in the dye bath. The color turned out light because I did this one last and ran out of time. This technique opens a world of possibilites! 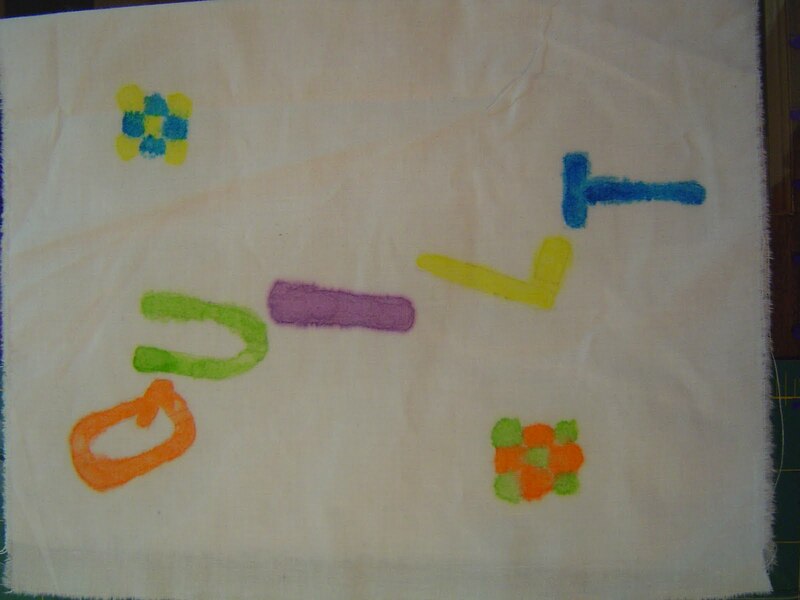 I would recommend this activity to any group of quilters. 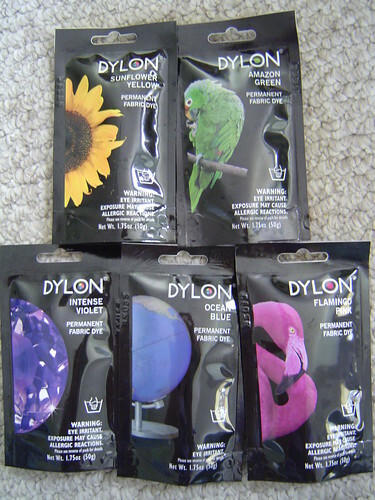 Smaller groups can get away with 1 pack of dye per color (for use with smaller pieces of fabric, such as Fat Quarters.) Larger groups, or if your group will be dying yardage, may want to use 2 packs per color. Our group used 1 pack per color and had dye leftover! Combine the dye packs with a couple of buckets or tubs from the Dollar Store for each color (one for the dye bath and one for the rinse water) and this is an affordable project. Better still...It's TONS of fun! The only thing I would change about our event would be to add tables next time for the rinse procedure. It often takes some time and multiple buckets of water to rinse out the excess dye. It's rather back-breaking work, if the rinse basins are on the ground. We might also want to have more squirt bottles and some spray bottles available for additional dyeing options. I really hope you will try this with your group of quilting friends. I am pleased to report that my 2nd quilt has been completed for the UFO Club. This one is was an experiment in making a woven quilt. A friend had made a clock using woven strips and I thought I'd give it a try using the trimmings from The Margaret Mystery. I attempted to show you the back of the quilt (featuring the quilting) and a close-up, but (for some unknown reason) the pictures kept disappearing from my post. Anyway, I used wavy lines to counteract the straight strips and mimicked the swirls in the background. I did something on this piece that I wouldn't repeat. 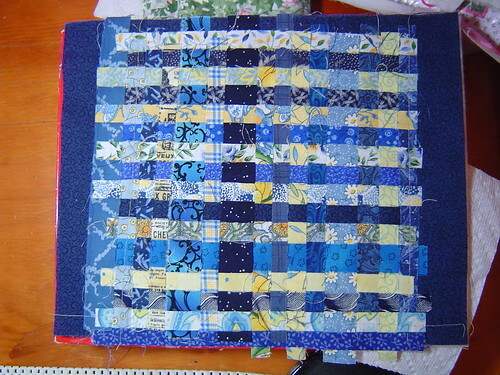 The strips were woven without adding fusible interfacing. 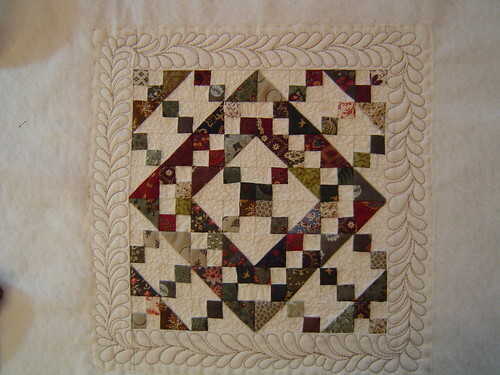 This made it a bit difficult when it came to the actual quilting! The close-up showed the fact that not all of the edges are completely stitched down. I chalk that up to the freeform technique that was used in the making of this quilt. Enjoy! I was a very busy quilter today! 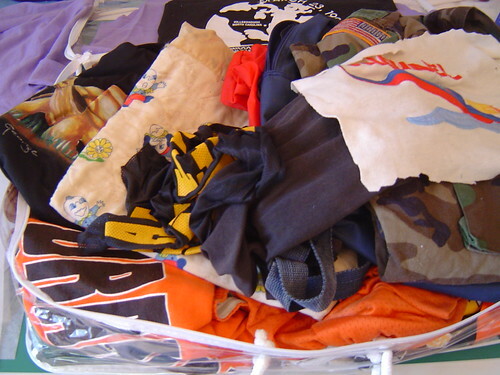 I went from this pile of shirts to this stack of pressed and stablized shirts in "just" 2 hours. Before beginning work on the T-shirt quilt I applied the binding to one of my quilts for the UFO Club. I call this Journal Quilt on Steroids. 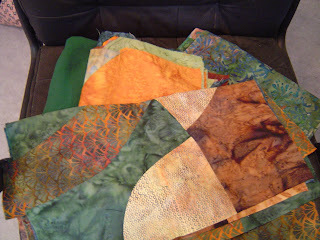 It turned out too big for the Journal Quilt Project that I'm working on, however, it refused to be cut down! Sorry about the picture. It's a little blurry, but the resident photographer was at Swim Team when I wanted to post here. 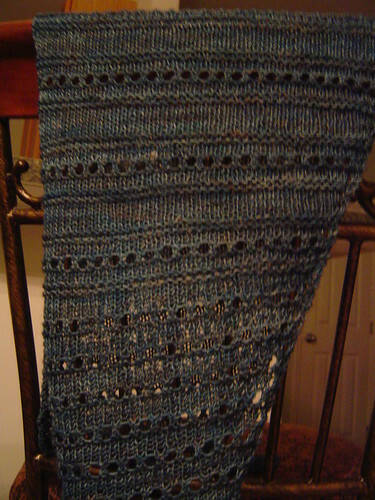 This is not the BEST picture, but I finished my JJ Scarflette too late in the day to get a better photo. I've been knitting for a very short while in comparison to my quilting "career" but I am really enjoying learning new skills. (Not that there aren't more things for me to learn about quilting, mind you!) However, my knitting "career" began at a time when I found it difficult to quilt and it has been my constant companion since. I must be writing too late at night. I'm beginning to get sappy! Sorry about that. I'll be back to my regularly scheduled posts soon enough. This year marks the 100th Anniversary of the Boy Scouts of America. 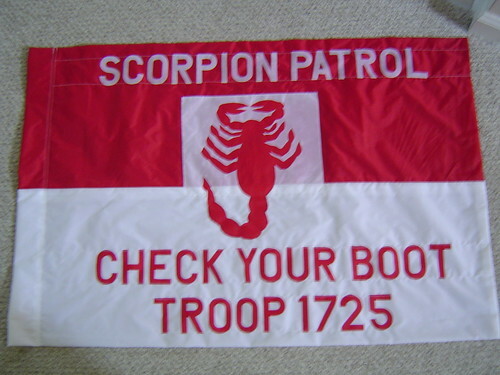 Troops who attend the annual Jamboree take flags to fly at their campsite during the event. 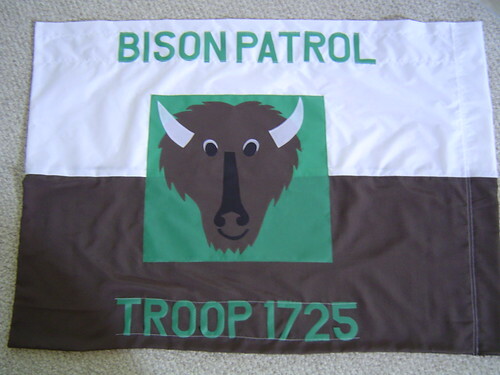 I have a friend who doesn't sew, so guess who got "volunteered" to make the flags for her Eagle Scout's troop? (That would be ME!) 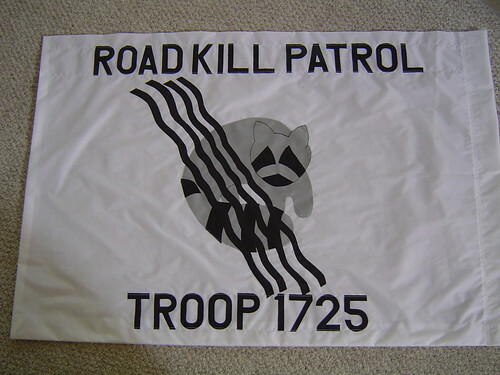 My friend and I have been talking about these flags for months now. In the last two weeks, they have been transformed from a stack of fabric, stencils and drawings into the flags shown above. 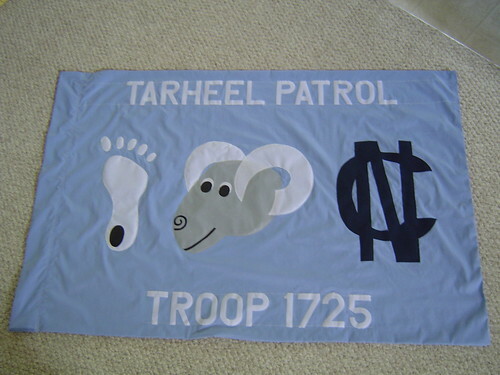 The flags were designed by Mebane, NC area Scouts. I enjoyed the collaboration and was happy to help make their vision a reality. The artwork was done by a local artist and I did all of the stitching. As you can see, I have included a selection of projects that ranges in level of completion. I know that I should be starting with older UFOs, but I did throw in a few for good measure! Once I begin finishing some of these, I'm sure to get excited. Plus, I'll make sure to continue with some older UFOs next session. Every quilt has a story. My plan is to share those stories with you as I complete each of these quilts. I hope all of my American friends enjoyed the 4th of July weekend! I wanted to share my most recently completed quilt. 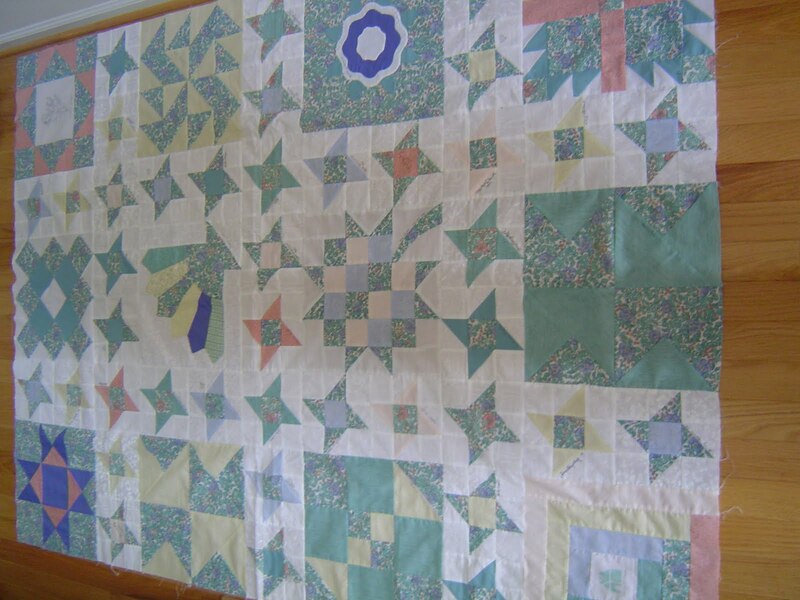 It was pieced in 2005 or 2006 with the leftover blocks from a king sized quilt of the same design and was meant to be the FIRST quilt finished in our new house, but it got lost in the move. It was missing for 3 years! (Maybe I should call it The Lost Quilt.) Once found, it moved back into the rotation for finishing. Ah! The finishing rotation...I stared at it for a month (or more) deciding if I wanted to tackle the quilting myself or if I wanted to send it out to be quilted. In the end, I decided that I wanted my friend Sarah to quilt it. As you can see, she did a wonderful job! As you read in my first blog post, my friend Jenn from the Quilters Knitting group on Ravelry and I decided to start a UFO Club. This was enough to get me going on this quilt again! I applied the binding and began the process of stitching it down by hand. The name of the quilt ultimately came from the surprise that I felt on the day that I completed the project...my 2 boys got haircuts after 4 years of growing their hair long. Hooray! Clean cut boys and a newly finished quilt! What could be better? I'm SO glad that you stopped by to see what I've been working on! My blog was started at the request of some Ravelry friends. We were starting a UFO Club and they wanted to be able to see the projects on my list. Each term, I'll post "The List", along with pictures of new additions. Subsequent posts will show the progress I've made and any quilts that I complete. Hopefully, you'll enjoy reading a little about these projects, too. From time to time, I may post additional works here, too. Feel free to comment. I'd be happy to hear from YOU. 18 in 18... Goal Exceeded!!! 2/14 - Large Yarn Bowl for ME!!! 17 (Projects) in 2017... Oh, yeh!!! 12/14 - Stacy's Red "Yarn Bowl"
12/14 - Pat's Dotty "Yarn Bowl"
12/13 - Marie's Quilted "Yarn Bowl"
12/12 - Beth's Purple "Yarn Bowl"
12/11 - Nicole's Pink Quilted "Yarn Bowl"
12/1 - Belinda's Quilted "Yarn Bowl"
16 (Quilts) in 2016... Some were small, but... Yes! Yes!! Yes!!! 12/29 - Coffee Ornament "J"
12/14 - Coffee Ornament "C"
12/14 - Coffee Ornament "H"
12/14 - Coffee Ornament "K"
12/14 - Coffee Ornament "T"
1/27 - CCLQ Bluff Challenge "Quilt"
15 (Quilts) in 2015... Quilts, no. Projects, yes! 14 (Quilts) in 2014... No... Projects? Yes! 13 (Quilts) in 2013... Not Likely! 11/9 - Expanded "Britt Bag"
I've been quilting since 1991 and knitting since 2008. I enjoy both and find it difficult to choose which I prefer most. Thank goodness, that's NOT a requirement! Cheaper than therapy, healthier than alcohol. That’s my story, and I’m sticking to it!